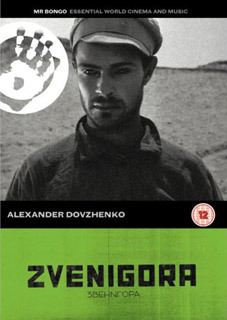 Following on from their recent DVD release of Earth (Zemlya), Mr. Bongo Films has announced the UK DVD release of trailblazing Soviet director Alexander Dovzhenko's first two films of his loose trilogy, Arsenal and Zvenigora for February. Arsenal (1929 – also known as January Uprising in Kiev in 1918) is the remarkable, action-packed film based on the real life events of the Ukranian Civil War and stars Semyon Svashenko in the lead role. Set in the bleak aftermath and devastation of World War One, a recently demobbed soldier, Timosh, returns to his hometown of Kiev after surviving a train wreck. His arrival coincides with a national celebration of Ukrainian freedom, but the festivities are not to last as a disenchanted Timosh soon begins to clash with the city's authorities when he starts to agitate for the adoption of the Soviet system. 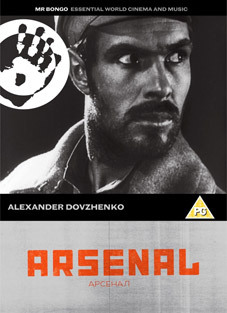 Arsenal is an emotionally affecting film that was described by the Chicago Tribune as representing "the summit of Soviet cinema and remains one of the most poetic and visually beautiful of all Russian films," while the New York Times called it "a visual poem filled with exquisite, haunting images of the years leading up to the great revolution." Zvenigora (1928) stars Nikolai Nademsky (Earth), as the grandfather of Timoshka (Semyon Svashenko), whom he alerts to secret treasure buried in the mountains and the boy spends the rest of his life trying to find. The film blends lyricism with politics and uses its central construct to build a montage praising Ukrainian industrialisation, attacking the European bourgeoisie, celebrating the beauty of the Ukrainian steppe and re-telling ancient folklore. Zvenigora is a most remarkable avant-garde film, which has a unique style in its approach and disregards the more traditional storytelling devices. Speaking of the film, the great Sergei Eisenstein said, "As the lights went on, we felt that we had just witnessed a memorable event in the development of the cinema." Arsenal and Zvenigora will be released individuaklly on UK DVD by Mr. Bongo Films on 14th February 2011 at the RRP of of £12.99 each. No extras have been listed.